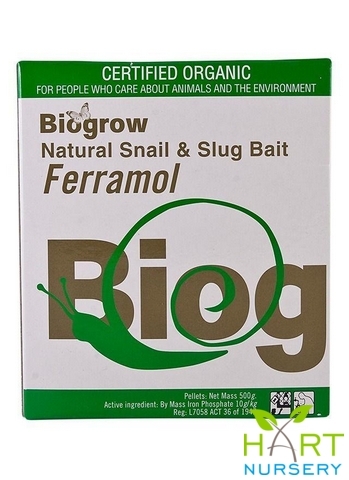 This product is a unique blend of slug and snail bait additives with an iron phosphate active ingredient. The iron phosphate is used as an ingredient in fertilizers and occurs in soil. The bait is attractive to snails and slugs and lures them from their hiding places and plants. Ingestion even in small amounts will cause them to cease feeding. This physiological effect of the bait gives immediate protection to the plants. After eating the bait, the slugs and snails become less mobile and begin to die within three to six days. This product is effective against a wide range of slugs and snails and will give protection to lawns, gardens, greenhouses, outdoor ornamentals, vegetable gardens, fruits, berries, citrus and crop plants. The bait can be scattered on the lawn or on the soil around any vegetable plants, flowers or fruit trees or bushes to be protected. The slugs and snails controlled by this product include: Deroceras spp., Arion spp., Limax spp., Helix spp. and Cepaea spp.